Click FC, Draw ROI. Both making a *.csv with coordinates (input type: file) or input coordinates divided with “;”(input type: manual) are admitted in BRANT. Fig.2 shows the format of the csv file. Choose a *.nii file as an example. 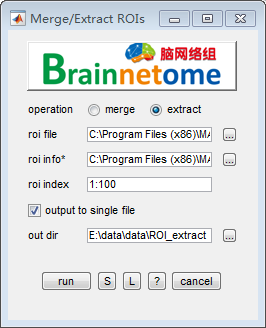 The output files will follow its extracting information of origin, voxel size, bounding box, etc..
Click Merge/extract ROIs in FC GUI, switch the operation to extract. Input roi index to choose which part you need in the roi file. Click ROI Calculation in FC GUI. Select the folders as input directories where STEP 2 outputs. 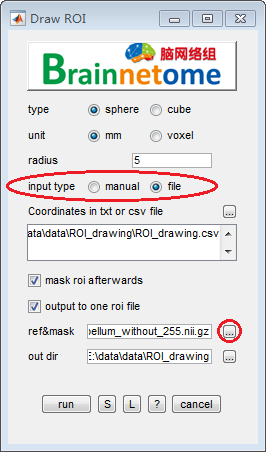 Change filetype to fdnoGSR*.nii, input roi file and roi index or just use the default settings. Select output directories.